MOON HOAX: DEBUNKED! : 11.8 Was alien music heard during Apollo 10 and kept secret? IN A NUTSHELL: No. It was radio interference between the two Apollo spacecraft modules, it wasn’t music at all, and it wasn’t kept secret. THE DETAILS: It is alleged that while Apollo 10 was flying over the far side of the Moon and was out of radio contact with Earth its crew heard in their headsets “strange music-like radio transmissions” and that this event was kept secret for decades. In 2016, the Huffington Post reported this claim, noting that it was made in NASA’s Unexplained Files, a Science Channel TV show. The crew of an Apollo mission to the moon were so startled when they encountered strange music-like radio transmissions coming through their headsets, they didn't know whether or not to report it to NASA, it's been revealed. [...] Almost four decades went by before lost recordings emerged that revealed something unsettling that the three Apollo astronauts had experienced while flying above the far side of the moon. [...] The transcripts of the Apollo 10 mission were classified and untouched in NASA's archives until 2008. Actually, a little fact-checking shows that the event didn’t unsettle the astronauts in any way and wasn’t kept secret at all. Moreover, the recordings were never lost and the transcripts were already declassified in 1973. 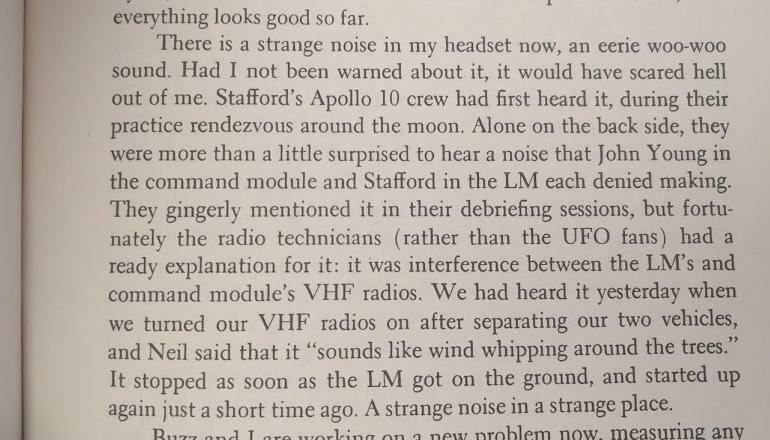 John Young, who was on board Apollo 10, figured out the reason for the sounds as they were occurring: in the onboard audio recordings he can be heard noting that they are “Probably due to the VHF ranging, I guess”. VHF ranging was a technique which used the VHF voice radios of the spacecraft to determine the distance between the Lunar Module and the Command Module. In other words, it was obvious even to the astronauts themselves that the sounds were coming from the Apollo spacecraft, not from some alien source. After some amusement at the unexpected noise, the astronauts resumed their work with no sign of concern. There is a strange noise in my headset now, an eerie woo-woo sound. Had I not been warned about it, it would have scared hell out of me. Stafford's Apollo 10 crew had first heard it, during their practice rendezvous around the moon. Alone on the back side, they were more than a little surprised to hear a noise that John Young in the command module and Stafford in the LM each denied making. They gingerly mentioned it in their debriefing sessions, but fortunately the radio technicians (rather than the UFO fans) had a ready explanation for it: it was interference between the LM's and command module's VHF radios. We had heard it yesterday when we turned our VHF radios on after separating the two vehicles, and Neil said that it "sounds like wind whipping around the trees." It stopped as soon as the LM got on the ground, and started up again just a short time ago. A strange noise in a strange place. Figure 11.8-1. Michael Collins explains the allegedly mysterious sound in his book Carrying the Fire. * Apollo 10 Audio — Publicly Available Since 1970s, Tumblr.com, 22 February 2016; NASA History Office, Twitter.com, 22 February 2016. Figure 11.8-2. 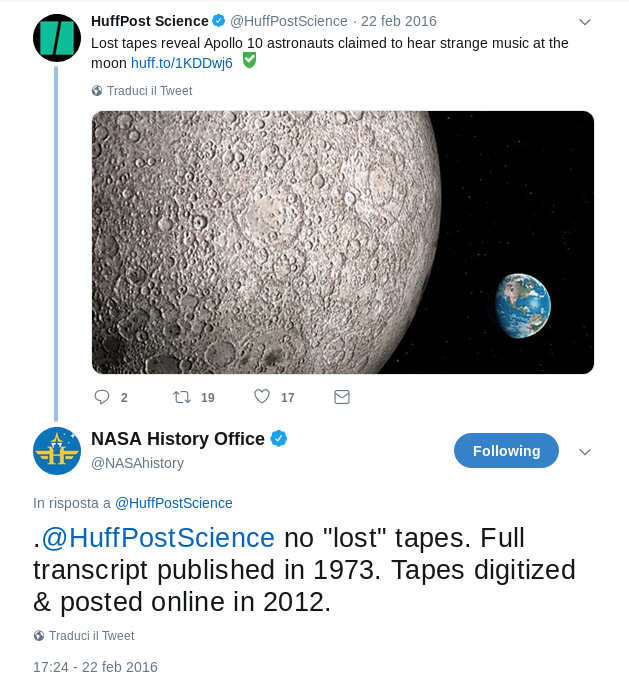 NASA’s reply to the Huffington Post article. Additionally, listening to the original recordings and the transcripts of the astronauts’ onboard conversations* makes it very clear that there was no actual music involved. * Apollo 10 Onboard Voice Transcription, classsified confidential in 1969 and released to the public in 1973, pages 241-242; Apollo Flight Journal, Day 5 part 20. 102:13:02 Cernan: That music even sounds outer-spacey, doesn't it? You hear that? That whistling sound? 102:13:14 Cernan: Yeah. Sounds like - you know, outer-space-type music. 102:17:58 Cernan: Boy, that sure is weird music. 102:18:07 Cernan: No. It's a whistling, you know, like an outer space-type thing. * Apollo 10 astronauts heard 'music' behind the Moon, Godlikeproductions.com (2008); Apollo 10 crew heard "music"....., Apollohoax.net (2009). The Post later published a correction; NASA’s Unexplained Files did not.